It might seem impossible to look good when you are constantly sneezing and blowing your nose and your eyes are red and puffy, so why even bother, right? But the problem is, lots of us still have to go to work when we’re feeling a little under the weather and looking as bad as you feel isn’t always an option. 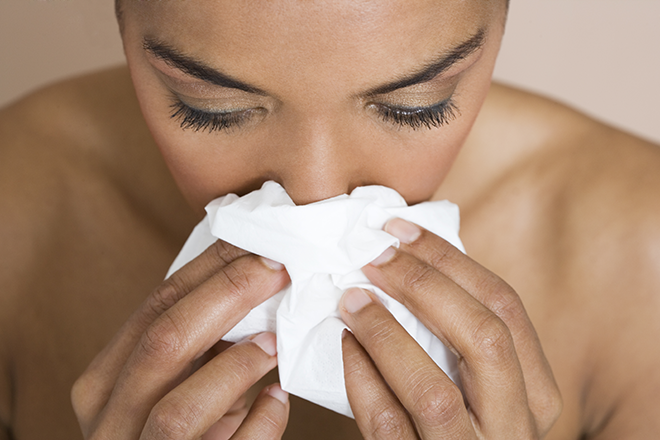 So, should you wear make-up when you are sick? Obviously, if you are at home in bed then there is no need, but if you are up and at the office then here are a few tips that will help you keep your chin up, despite the pounding head. An intense facial moisturiser will form a protective barrier over your skin, ensuring it stays supple and keeps redness to a minimum. Before going to bed use an intense night cream that will prevent it from getting dry and will help to fortify skin against sensitivity. If the skin around your nose is red and flaky from too much blowing, gently exfoliate with sugar (but not too hard, you don’t want to cause any damage) and then cover it with an intensive moisture balm. Make sure you choose a decent facial tissue as well, or even better a balsam or oil-impregnated ones with Calendula or vitamin E. We love the Twinsaver Essentials 3-Ply tissues with Calming Vitamine E, R21,95. After moisturising, cover your face in a primer. This will help give your skin an even tone, balancing out the blotchy parts. It will also help to ensure your foundation stays in place, even after multiple nose wipes and eye rubs. When you’re sick your body retains water in an attempt to heal itself, and puffy eyes are one of the side effects. To keep them covered, dab concealer over the dark patches. Expert tip: Allow your skin to fully absorb any moisturiser or balm you apply before adding make-up, otherwise it will form a paste on your face. Skip colours that are too intense, like any pinks or reds. When you are feeling a little under the weather a touch of bronzer and some neutral blush on the cheeks and lids is just enough to perk you up, without drawing too much attention to your already red nose! Your teary eyes and constant sneezing won’t be helped by too much eye make-up. If it doesn’t disappear entirely, it’ll end up half way down your face by the afternoon, never a good look. Dab a little bronzer in the upper corner of your eye and a slick of waterproof mascara. Keep eye drops with you during the day to keep them moisturised. One of the easiest ways to look better is to keep well hydrated. It not only helps on the inside but will help fight inflammation on your face. Try water with lemon – hot or cold, it keeps you hydrated and loosens up stuffiness and congestion. Decaf tea is super comforting when you’re feeling rough, the heat can soothe sore throats, stuffy noses, chest congestion, and upset stomachs. If you pick one with herbs like ginger, your immune system may get a small boost, too. For an extra benefit, try adding a small dollop of honey to your cup, it can calm your cough. However, you probably can’t wait to get home and just wipe it all off. When you do, cover your face in moisturiser again. Now, get yourself to bed! Yes the lemon works really well. I usually take a medlemon when I’m feeling under the weather and it really works a charm. Mmmm interesting about the lemon, I love lemon in my water but didn’t know it loosens congestion. Interesting read, though I tend to not wear any makeup when im not feeling well lol only when I start getting better, even then its very minimal. Tissues with Calendula always keeps my nose from drying out with all the blowing and wiping. I really hate it when you blow your nose and the tissue looks like you are removing your war paint. Waterproof mascara makes me eyes itch though.